Tokushima Castle is classified as a hilltop castle, and is located in Tokushima Prefecture. During the pre-modern age, it found itself within the borders of Awa Province. It is associated with the Hachisuka clan. Dates in use: 1585 - 1869. Just a handful of defensive buildings ever existed at Tokushima castle. A main tower, two multi-storied turrets & a gate. Regarding the original main tower, not a great deal is known but its replacement was said to be built in a vulnerable location, that being within the secondary defensive area. Either side of where the Ōte Gate once stood was the large, three-story Taiko Turret to the left and a smaller Turret to the right. 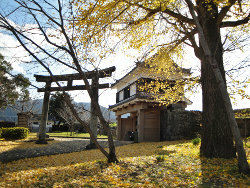 Remaining today is the Eagle Gate (Washinomon). Also, the castle grounds house a garden & a museum displaying items of the castle's glory days. 1588 A main tower was built and was torn down about 35 years later. 1615 The three-story turret of the Higashininomaru was built to replace the main tower. 1869 The main tower of the Ninomaru was torn down. 1874 All remaining buildings were demolished with the exception of the Washino Gate. 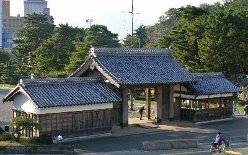 1989 The Tokushima castle museum opened along with a rebuilt Washi no Gate (鷲の門).